CardioPRIME™ is a human primary cardiomyocyte-based assay designed to simultaneously assess pro-arrhythmia and inotropic risk. CardioPRIME™ leverages the tight electromechanical coupling that exists in primary cardiomyocytes. 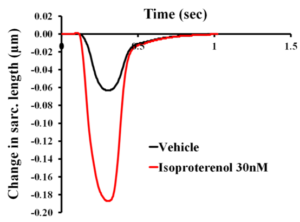 As illustrated in the figure below, any drug-induced alteration of the action potential will result in a modification of the intracellular calcium dynamics, resulting in changes to the contraction/relaxation cycle. Therefore, in contractility assays, drug-induced action potential prolongation is detected as relaxation prolongation while pro-arrhythmic EADs are detected as after-contractions. We recently validated CardioPRIME™ using 38 drugs with known human toxicity profiles and reported a 96% predictivity. Please see Nguyen et al. 2017 published in Frontiers in Physiology for a detailed report. The video above shows brightfield imaging of a living adult human primary cardiomyocyte. Cells are continuously paced in an electrical field* and exhibit contractility transients in response to each stimulus. Changes in sarcomere length are visualized in the top half of the video at 0.5, 1 and 2Hz. Cells exhibit an increase in sarcomere shortening in response to increases in stimulus frequency. This positive frequency-contraction relationship is a fundamental property of the human heart and, in the isolated adult myocyte preparation, is indicative of normal physiological calcium handling and electromechanical coupling. This property is not observed in stem cell-derived myocytes. Human primary cardiomyocytes exhibit aftercontractions when incubated with pro-arrhythmic drugs. 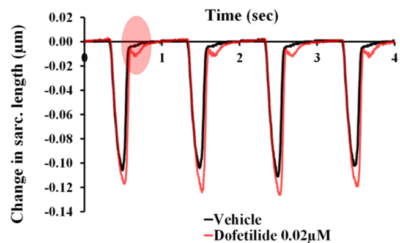 In the example below, the contractility transients induced in adult human cardiomyocytes are recorded in vehicle only (black trace) or in the presence of 0.02μM dofetilide (red trace). The aftercontractions are apparent in the red trace right at the end of each contraction transient. An example of the AC event is highlighted with a pink ellipse. CardioPRIME™ detects drug-induced inotropic effects by reporting changes in sarcomere shortening. 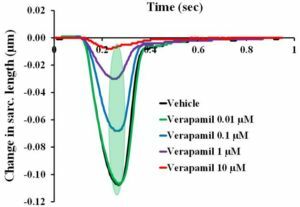 As shown in the figure below (LEFT), the calcium channel blocker verapamil, which is known to reduce cardiac contractility in human, induces a decrease in the amplitude of sarcomere shortening. 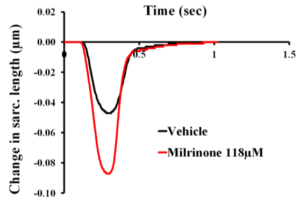 Conversely, human primary cardiomyocytes exhibit the expected positive inotropic effect when exposed to drugs known to increase contractility (see the effect of milrinone in the figures below, CENTER and RIGHT). This allows the CardioPRIME™ assay to reliably identify positive inotropes at early stages of drug discovery. By contrast, stem cell-derived cardiomyocytes do not increase the amplitude of contractions in response to positive inotropes, possibly due to anomalies in the intracellular calcium handling and/or disturbances in the excitation/contraction coupling. What is the turnaround time for drug testing in CardioPRIME™? CardioPRIME™ is a cell-based assay currently run on the MultiCell platform by Cytocypher-IonOptix. The moderate throughput enabled by this platform allows for a turnaround time of approximately 10 days. Do you test drug effects in cardiomyocytes from different donors? Studies conducted at AnaBios have demonstrated that donor-to-donor variability in drug effects is very low when cells from hearts not affected by cardiac disease are used. It is therefore sufficient to rely upon cardiomyocytes from a single donor; this allows for a rapid turnaround time. When the possibility of donor-to-donor variability is a concern, it is possible to perform studies involving the use of cardiomyocytes from multiple donors. What is the sensitivity and selectivity of CardioPRIME™? We have extensively validated CardioPRIME™ utilizing a set of 38 molecules with known clinical outcomes, previously selected by the CiPA and JiCSA initiatives. Based on these studies, we have reported a sensitivity of 96% and a specificity of 100% (see Nguyen et al., 2017 ). How is the cell-pacing frequency controlled? CardioPRIME™ utilizes primary adult human cardiomyocytes. These cells do not exhibit spontaneous contractions and require external stimulation. Cells are paced at 1Hz via field electrodes. Are controls and washouts included in the assays? Relevant positive and negative controls and a washout period can be included in the study design. What is the assay format? Baselines for all cells are obtained prior to cumulative concentration testing. Drug effects are compared to their determined baseline. What is the drug exposure time in CardioPRIME™? A standard assay is two minutes per concentration. The overall duration of the assay is about 20 minutes, including baseline control. The time can be allocated to the testing of multiple concentrations or extended testing of a single concentration. Which formulation vehicles are compatible with CardioPRIME™? Drugs can be formulated in saline buffer or in buffer containing 0.1% to 0.3% DMSO. Muscle cells that make up the heart and are responsible for contractions necessary for blood circulation. The basic functional structure of striated muscle cells. Sarcomeres are composed of long, fibrous actin and myosin filaments that slide past each other when a muscle contracts or relaxes. The risk of a drug to induce irregular contractions in the heart. Drug-induced arrhythmias can cause ineffective cardiac contractions and reduced cardiac output, which can lead to serious, and even fatal, adverse events. The risk of a drug to induce changes in cardiomyocyte contractility. This can result in reduced contractility (negative inotropy) or enhanced contractility (positive inotropy). The former can lead to dangerously low cardiac output, while the latter can lead to cardiac overexertion and possibly heart failure. The mechanistic coupling of electrical excitability and contractile activity in cardiomyocytes. Following an initial depolarization, once a sufficient number of plasma membrane voltage-gated sodium channels are activated, an action potential is initiated in a cardiomyocyte. The resulting depolarization activates the voltage-gated calcium channels. The influx of calcium ions further triggers calcium release from the sarcoplasmic reticulum. The increase in cytoplasmic calcium activates the contractile machinery, leading to sarcomere shortening and cardiomyocyte contraction. The premature and abortive initiation of a new action potential, often resulting from a sustained cardiomyocyte depolarization and reactivation of voltage-gated sodium and/or calcium channels. It can lead to desynchronization of cardiac action potentials and abnormal secondary contractions across different regions of the heart, potentially resulting in life-threatening arrhythmias. An abnormal secondary contraction initiated by a cardiomyocyte in the absence of external stimulation. Aftercontractions can be the mechanical consequence of EAD and/or compromised intracellular calcium homeostasis, resulting from sustained and abnormal cytoplasmic calcium levels. To download AnaBios’ cardiomyocyte posters and publications, please click on one of the buttons below. Effect of Ozanimod (RPC1063) on Action Potential Parameters in Adult Human Purkinje Fibres. N. Abi-Gerges, P. Miller, A. Ghetti, F. Scott, K. Meadows, B. Clemons, P. Frohna, G. Page and G. Opiteck. Adult Human Primary Cardiomyocyte Model for the Simultaneous Prediction of Drug-Induced Inotropic and Pro-Arrhythmia Risk. N. Nguyen, W. Nguyen, B. Nguyenton, P. Ratchada, K. Truong, G. Page, P. Miller, A. Ghetti and N. Abi-Gerges. Action Potential Recording and Pro-Arrhythmia Risk Analysis in Human Ventricular Trabeculae. Y. Qu, G. Page. To inquire about products, services and pricing, please complete the contact form below and click the “Submit” button.